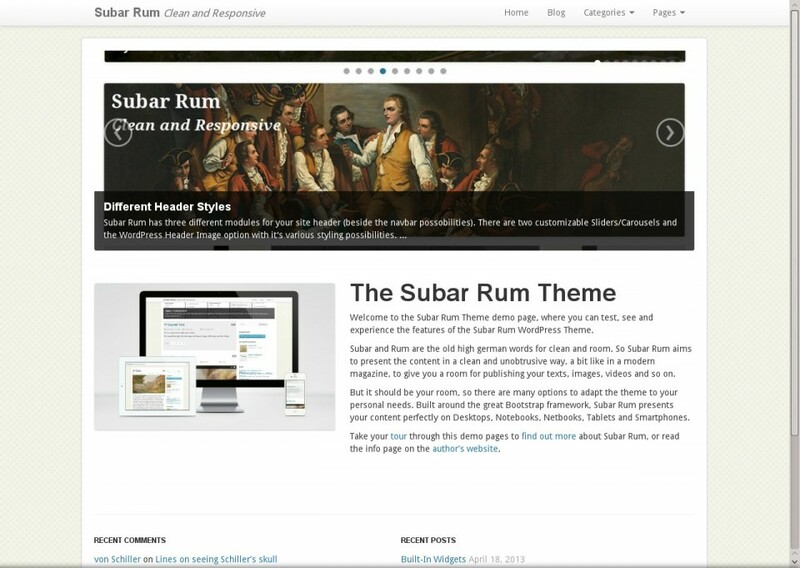 Subar Rum (old high german for clean room) is a clean and fully responsive WordPress theme built around Bootstrap with many options to adapt it to your needs. 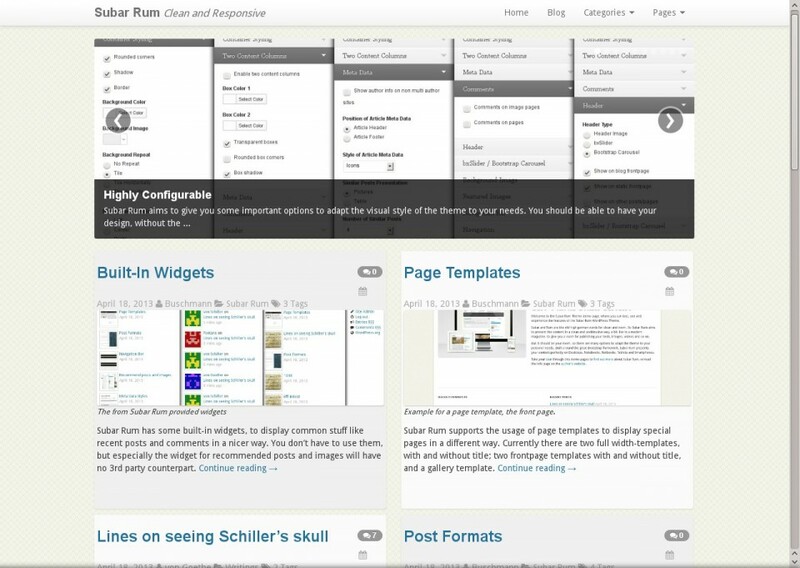 It features some built-in widgets for a nicer presentation and posts and images can be marked as recommended to present them in two different image sliders/carousels in the main content header. 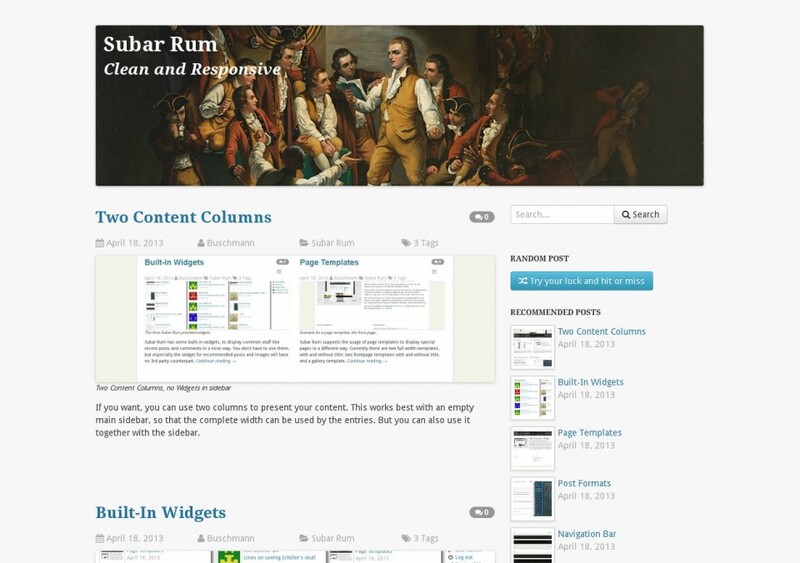 It makes intensive use of the post thumbnail feature and adds some additonal image sizes. 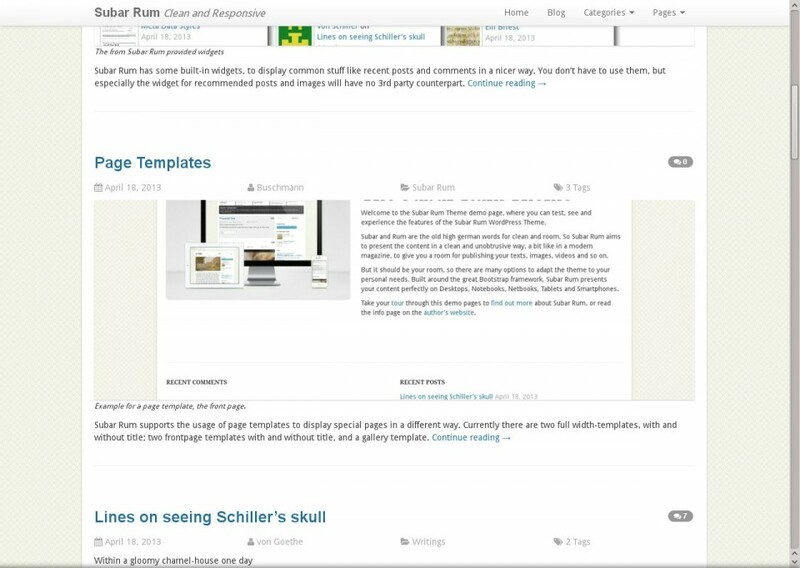 Beside different stylings for post formats there are optional page templates for full width presentations and a template for a static front page with own widgets. Furthermore it is possible to display the blog layout in two columns. Sleek, intuitive, and powerful front-end framework for faster and easier web development. Bootstrap was made to not only look and behave great in the latest desktop browsers (as well as IE7! 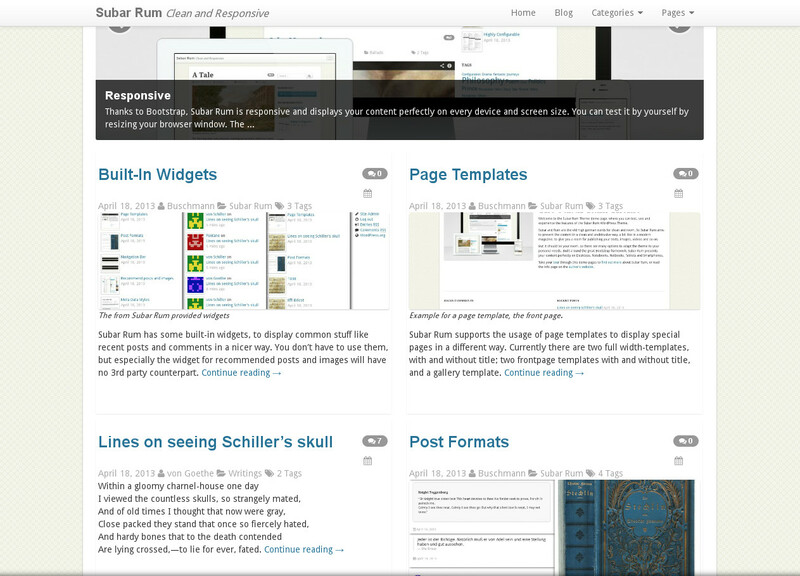 ), but in tablet and smartphone browsers via responsive CSS as well. The iconic font by Dave Gandy designed for use with Twitter Bootstrap, but not only with that. 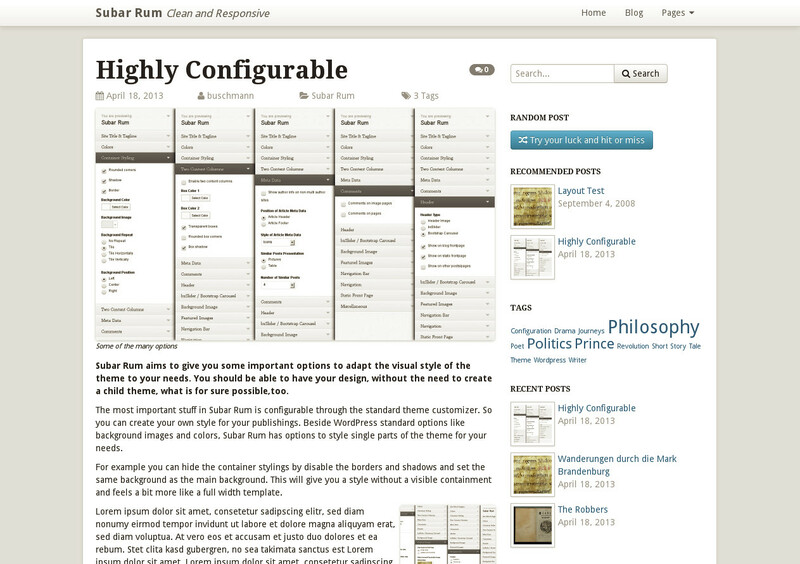 Hundreds of great icons in a single collection, infinite scalable, easily controllable with CSS. Fits on screen readers just as on very high dpi displays. And works even on crap like IE7. 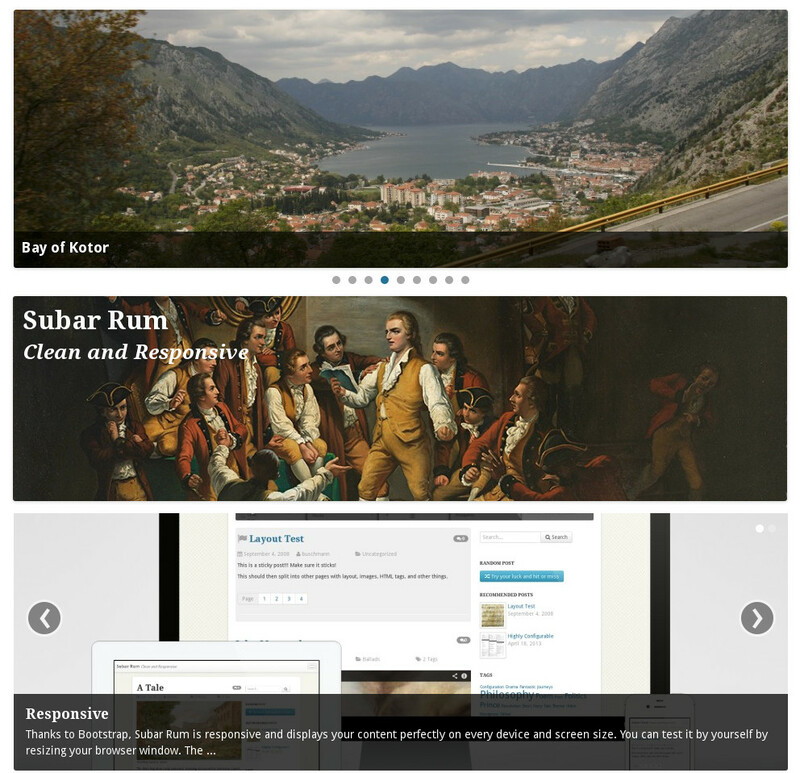 The responsive jQuery content slider by Steven Wanderski. Easy to use and integrate, with tons of configuration options. Built-in advanced support for touch and swipe. Can contain images, video, or HTML content and supports all major browsers, even crap like IE7. 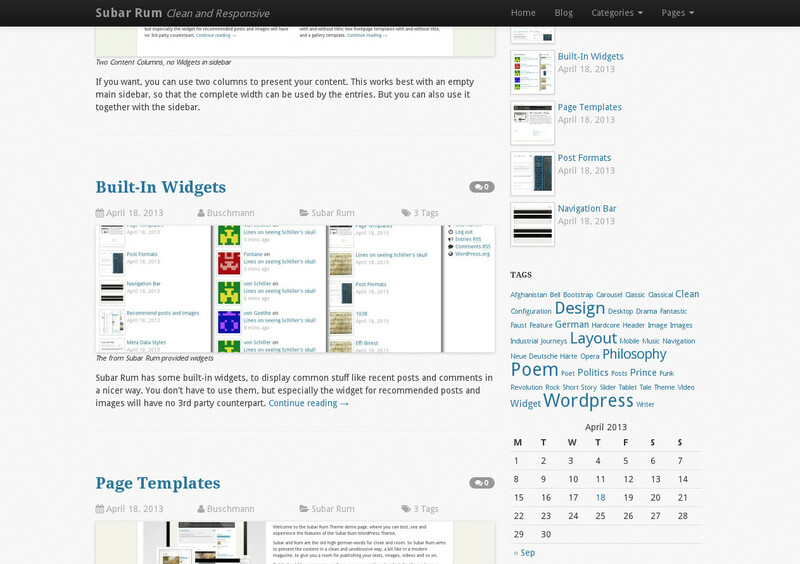 Many options to configure the theme for your needs. Clean and unobtrusive base design. 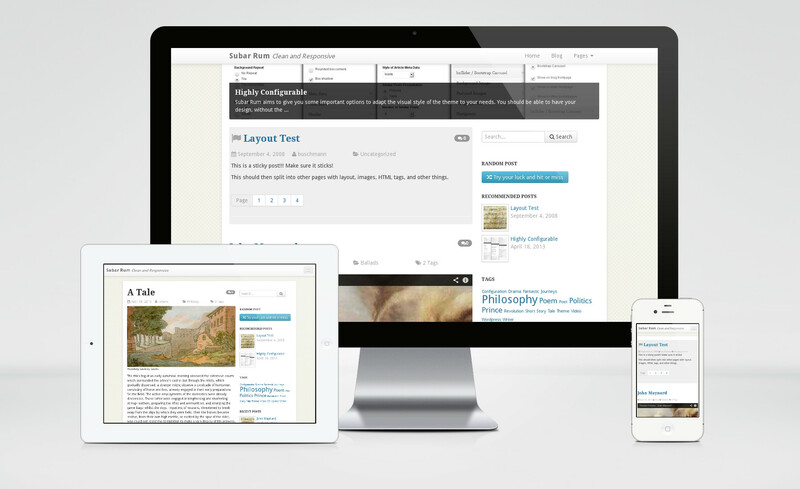 Fits to every size, from Desktop to Mobile. Choose between Header image, two carousels/sliders or disable it. 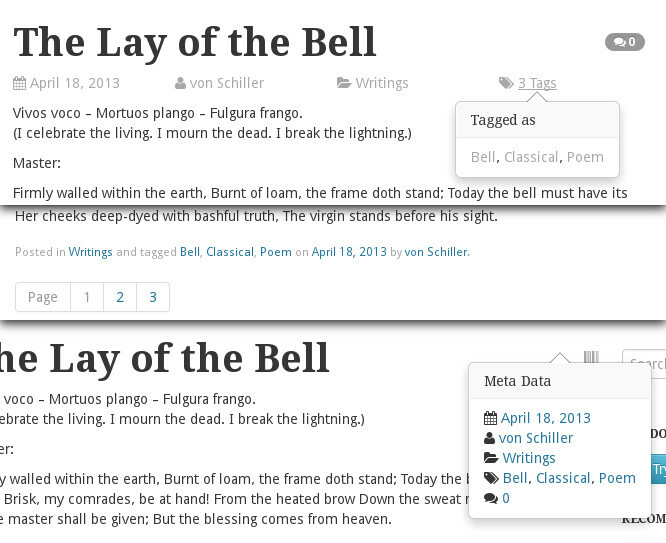 Different presentations for the entry meta data. Recommend posts and images and show them in slider and/or widget. 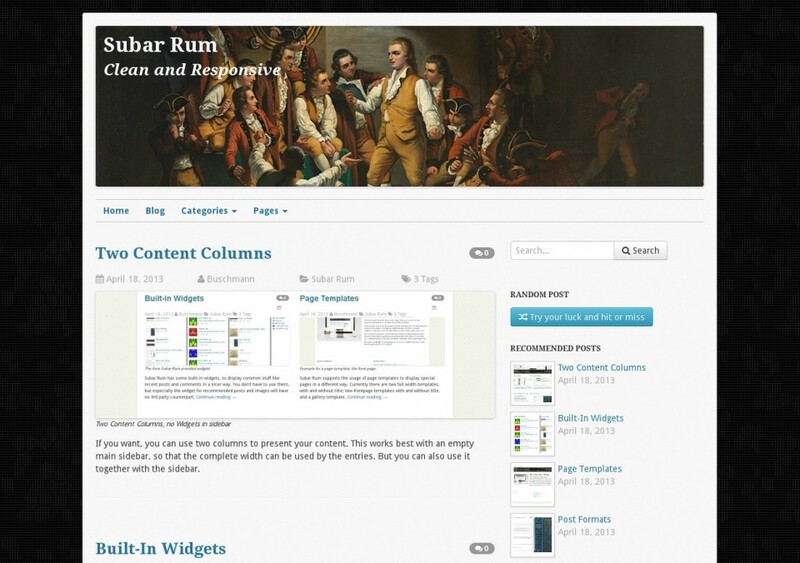 Configurable top navigation bar, either with menu or search field. 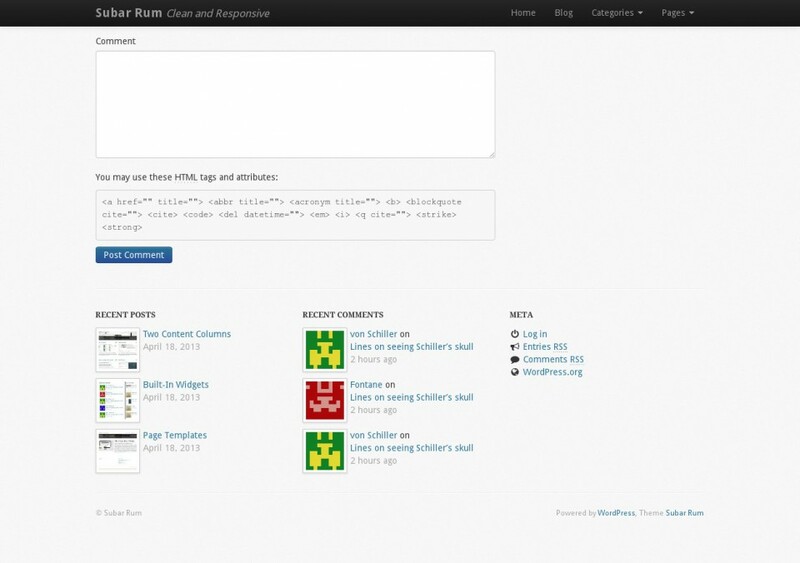 Templates for full width, full width without header, galleries and front page. The last two with own widget areas. For a nicer presentation of recent posts and comments, one with random post button, one for presenting recommended items. Start to show up you own language. In addition to English, German is already integrated. Optionally you can present the posts in the blog view in two columns. 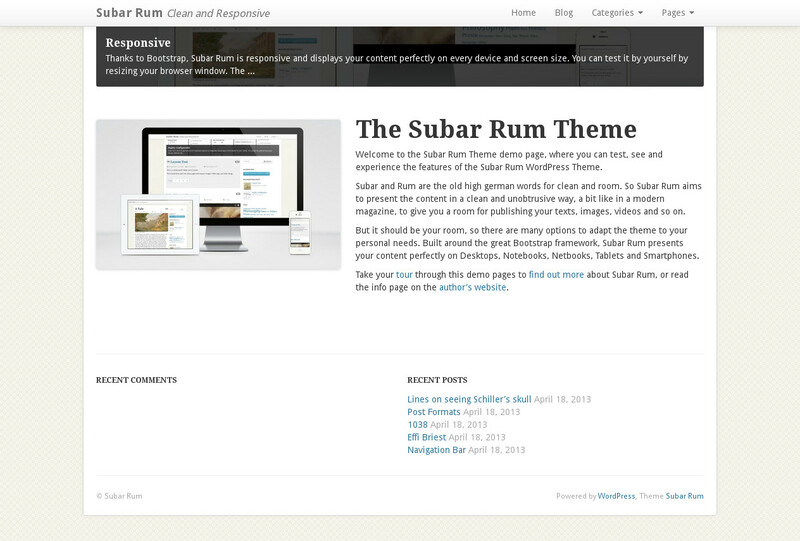 Here are some screenshots of layouts and designs that are possible with Subar Rum. For sure, that are not all possibilites this theme gives to you. Tested on all major browsers and rendering engines. Best looking on modern browsers. 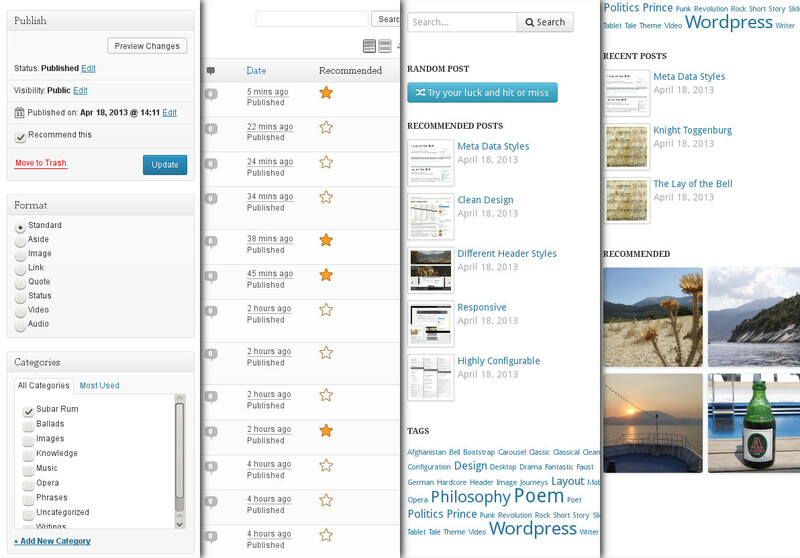 Works on IE7 and IE8 too, but doesn’t look that good on that crap like on a modern browser. Also tested on Android and Meego browsers. This list is randomly sorted, not by priority. 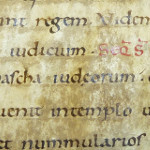 Integrate options to change the colors for text, links and other font elements. Format templates for currently not supported post formats, like chat etc. 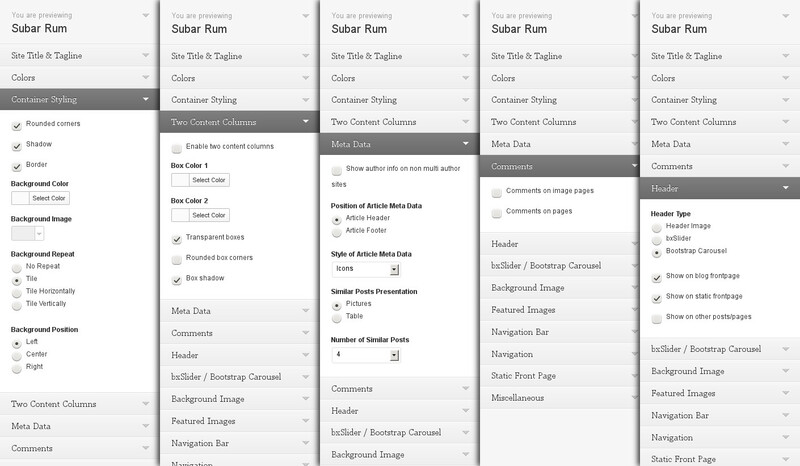 Either support custom web fonts or at a beginning a list to choose from. Add optionally template specific shortcodes to easily benefit from WordPress and Font Awesome in own entries and pages. 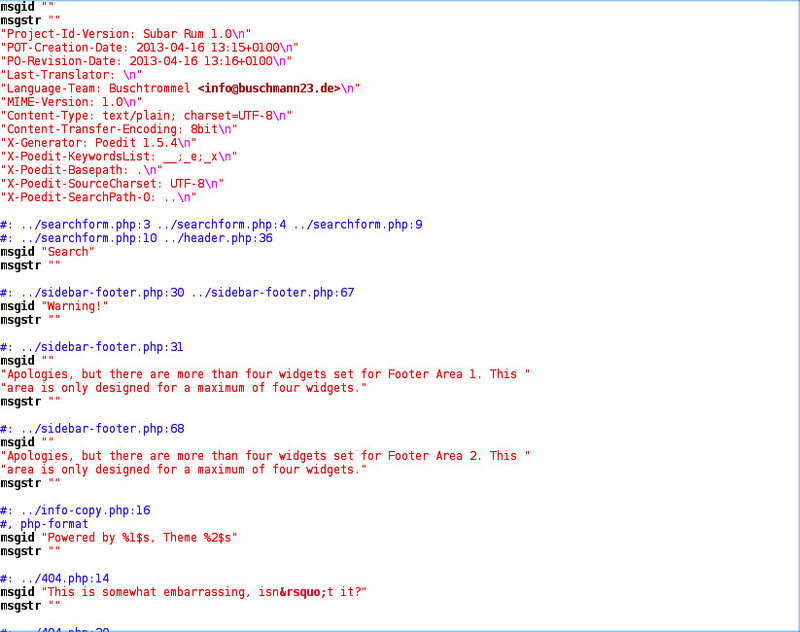 Integrate editor css file to show layout directly when writing. Nicer gallery presentation, either based on CSS or an modified gallery shortcode. 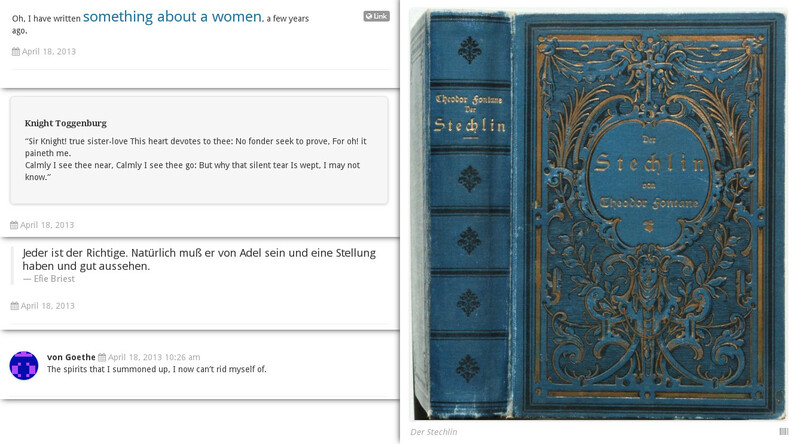 Include one ore more additional styles for the threaded comments to choose from. 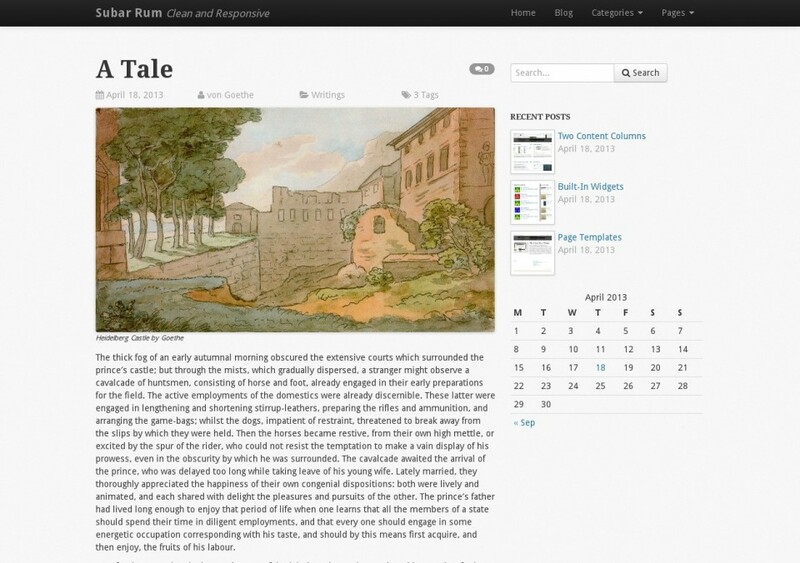 HTML5 Shiv by Alexander Farkas, Jonathan Neal, Paul Irish et al.